Flag display cases are beautiful frames that accommodate a folded flag safely as a photograph frame does to a picture. Most of them are created to have the shape of triangular frames in materials such as glass, wood or acrylic. At Flagsconnections.com, we provide you with the chance to personalize your display cases for your loved ones. Most of them are made with hardwoods such as cherry, mahogany, oak, and walnut. We are experts in the production and supply of durable display cases. 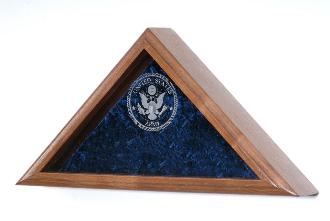 Flag display cases are also available as slightly larger flag-and-medal display cases. These are hut shaped cases with a triangular top portion of flags and the square bottom part for displaying medals and make an excellent wall mounted displays. Our flag display cases can also be offered as a casket flag case at the tomb of the deceased. Customers are free to make personalized requests for flag display cases, personalized flag frames, customized large flag case based on their individual needs. Hand crafted by veterans who are specialists in the art. Our flag cases are renowned for premium quality. Our display cases are manufactured with real American wood and not MDF. The double-strength glass front of the flag case is Laser Engraved with your choice of Service Emblem; Air Force, Army, Coast Guard, marine Corps, or Navy.